I am still in the early 80s with my next choice which is ‘Tell Me That I’m Dreaming’ by Was(Not Was). It’s another 12″ mix which is way ahead of this time. If you heard this on 6 Music today you would just assume it was the new Daft Punk single. It features Ronald Reagan samples two years before Trevor Horn liberally spread them over various remixes of Two Tribes, as the middle section uses Reagan’s first State Of The Union address from 1981: “Can we who man this ship of state deny, it is somewhat out of control? Was (Not Was) did go on to have a novelty hit with ‘Everybody Walk The Dinosaur’ and bizarrely are not the only act in my nominations to be more famous for a novelty hit about the Stone Age. I seem to recall I had it as a 7′ single with the mix spread over both sides which I then had to edit back together for compilation tapes, but here it is its uninterrupted, video-less glory. Should we have labelled this mini-blog ‘Lost in the 80’s ‘ ? Quite like this but not as good as ‘Out Come The Freaks’ which almost made it s one of my choices from the 80’s….almost but not quite…. Have no fear the 90s will also feature strongly, am doing them in vaguely chronological order. Nothing from 60s or 70s though. My day four choice is from 1978 – Tom Petty & The Heartbreakers, ‘I Need To Know’. This was the lead single from Petty’s second album, ‘You’re Gonna Get It’ which eventually went Gold in the US but this single failed to trouble the upper echelons of the Billboard chart, wasn’t even released in the UK and remains one of Petty’s less well-known songs. 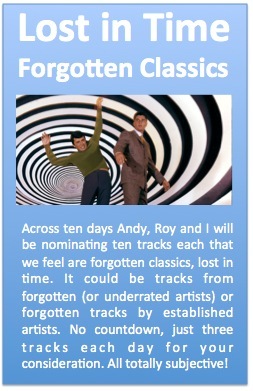 I fear I’m going to upset Roy as I too have plumped for yet another 80’s selection! So, following on from XTC yesterday, I move with chilling logic onto Thomas Dolby. “Why?” I hear you all cry. Well, when XTC’s front man, Andy Partridge, suffered from stage fright and refused to tour, in an effort to try and cajole him back into live performance, the other band members approached Dolby about taking over as front man for gigs. It never actually transpired and we (by we, I mean me!) can only dream what it might have sounded like. I’m going full-on 80’s tomorrow ! This passed me by completely; not the sort of thing you heard at a Black Flag gig. He was a very odd looking chap; a sort of Dickensian Elton John. Well I was wondering if this might happen- with 50 years of music to pick from, not just this artist, but this very track was down to be my day 7 choice. One of my all time favourite songs, period. So I will now have to turn to my subs bench, but I remain confident, even with a weakened team. I am choosing my words very carefully in that last sentence if you like clues…. I hope you’re not playing Mourinho “mind games” with me! Reserve team ? How much did Matic, Oscar and Salah cost ? Such poverty of resources ! You want to try having Danny Pugh as your reserve left-back, the only right-back at the club (a teenager) out injured and Michael Brown in midfield ! !